A pioneer Jewish Minister and Spiritual Leader of the Adelaide Hebrew Congregation for 50 years. Abraham Tobias Boas was born in Amsterdam, Holland, on 25 November 1842, son of Tobias E Boas, Rabbi, and his wife Eva Salomon Levi. Boas was educated at Amsterdam Theological Seminary. In 1865, he went across the North Sea to England to further his studies. In 1867 he became Minister at the South Hampton Synagogue where his conduct encouraged the Chief Rabbi to recommend him to the South Australian Hebrew Congregation. A small group of Jews had arrived in South Australia from as early as 1836. The first recorded Jewish settlers were Mr and Mrs Phillip Lee from England. However, the Jewish contribution started before 1836 when Jacob Montefiore was appointed one of 11 commissioners in the setting up of South Australia as a free colony. Public worship was not held until 1844 in a small room in Tavistock Street. The Adelaide Hebrew Congregation was established on 10 September 1848. A Synagogue in Rundle Street was built on land owned by George Morphett who sold it for £280 and opened on 9 August 1850. There were soon more than 130 subscribing members in the congregation. 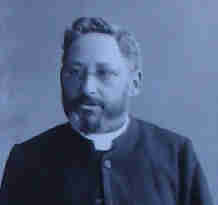 In 1869 Boas was chosen for the congregation at Adelaide and on 19 November the Jewish Chronicle reported that the Rev. AT Boas had accepted the office of Minister and Lecturer. Boas set sail on the Tamesa on 18 November 1869. During its voyage the ship lost most of her masts, rigging and sails in a cyclone east of the Cape of Good Hope but survived and arrived safely at Semaphore on 13 February 1870. The young minister was met by several members of the local Jewish congregation, who accompanied him on his walk to Port Adelaide where he caught the train to the city. He lived with Gabriel Bennett and family until his marriage. On the following Sabbath of 19 February, Boas preached his first sermon to the Adelaide Congregation. Before long he became an active participant in many aspects of South Australian life. On 30 March 1870 the South Australian Advertiser reported that the recently arrived Jewish Minister had delivered an address at the Town Hall to a large attendance which was characterised by great ability and eloquence and was very attentively listened to. A few weeks later Boas gave another lecture on Hebrew Literature attended by Jews and Christians alike. It proved to be a busy year with more lectures at Prince Alfred Wesleyan College and other educational institutions and marrying several young couples. One of the first were Alfred Myers of Wallaroo and Rebecca Hains who were married at Port Adelaide on 16 November 1870. On 7 July 1870 the foundation stone for a new Synagogue was laid by Gabriel Bennett, assisted by Boas who then delivered a stirring and forcible address urging all to liberality in carrying out this important and highly necessary work. Boas was also interested in non-religious affairs. On 19 December he was going to deliver a speech in support of the Saturday Half-Holiday Movement but had to decline at the last moment when he was told that his father had died in Amsterdam in October at the age of 70. At the consecration of the new Synagogue in Rundle Street on 26 March 1871, with accommodation for 350 worshippers, Boas delivered an appropriate sermon. The new building had rooms for a Sunday school, Committee meetings, and other purposes. One of the members of the building committee, and Warden was CL Klisser. The old adjoining Synagogue complex, built just 10 years previously, was to be the headquarters of a number of Jewish charitable organizations. Abraham Tobias Boas became involved with the Adelaide Theological College and in September conducted the first exams in Hebrew. Later he willingly placed his rich knowledge of Hebrew literature at the disposal of the theological students of Christian faith. He soon became a well-known figure in all movements intended to forward the cultural and material good of the community. On 28 December 1871 he was present at the Old South Australian Colonists banquet, hosted by Emanuel Solomon, as were GS Kingston, Judah Moss Solomon, John Hart and Sir John Morphett. When proposals were made for the establishment of a University, a committee, with Boas elected to the executive council, met on 8 October 1872 to discuss how the money donated by WW Hughes was to be used. Hughes himself preferred it for the endowment of Chairs, rather than buildings. On 15 May 1873 Abraham Tobias Boas married Adelaide born Elizabeth Solomon, who was the daughter of Isaac Solomon, an early pioneer and a member of the firm Salom and Solomon Auctioneers. They would have ten children. One of them Naome, died on 10 November 1882, aged only 5 months. Boas was well-read and esteemed as a student of English literature and drama, particularly of Shakespeare. He was Vice-President of the University Shakespearean Society from 1887. Many of his addresses before the Society were published in its Journal. He was a committee member for the purpose of obtaining guarantors to meet any deficiency that could arise from its publication. When he gave the Shakespeare Anniversary Lecture, in June 1901, he made the suggestion that a statue of the Bard be erected on the reserve facing the University. It wasn’t but a statute of WW Hughes, whose money had made it all possible, was. Down to earth and thoughtful, but broad-minded and anxious to be of service to other denominations as well, he was a welcome visitor at the YMCA, and often lectured on aspects of Jewish life and Old Testament history. Boas was a committee member of the Inebriate Asylum and also spoke in support to form a society for the Prevention of Cruelty to Animals. In 1877 he was secretary of the South Australian Branch of the Anglo-Jewish Association and on the committee of the local branch of the Palestine Exploration Society. Boas was, and remained, ever ready with a helping hand, so far as capacity would permit, for the distressed and troubled among the poor of all or no religious belief. Not afraid to speak his mind on political situations in Australia or overseas he was a valued member of any committee. When the topic of religious education in public schools was discussed in Adelaide he was one of several well-known people who voiced their opposition to the scheme. During 1880 he married several more young couples, including Leopold Judell of Orroroo and Rebecca Salom at Palmer Place, North Adelaide on 25 February. A week later he was back in North Adelaide to marry Henry Joseph Raphael and Emma Daniels. Naturally he also conducted funeral services. As the Jewish community was not very big he would have known most of those that were buried as well as their families. In 1882 he was treasurer of the Syrian Colonization Fund which aimed to assist Russian Jews to settle in north Syria and engage in agricultural pursuits. He still continued giving lectures, talks or entertainments in the Synagogue or anywhere else to Jews as well as non-Jews. In April 1883 he was at the Unitarian Christian Church with the topic of Jewish Celebrities. Two years later he was elected to the Strangers’ Friend and Charity Organisations Society and re-elected secretary of the Adelaide Hebrew Ladies’ Benevolent Society, a role later taken by his wife. This was followed by becoming a committee member of the Hospital Charity Saturday and Sunday. As if all this was not more than enough, he still found time to advertise his willingness to teach Hebrew to clergymen and theological students. In May 1887 he was at the Clayton Lecture Hall in connection with the Kensington Literary Society. This time his topic was Popular Proverbs and National Sayings, both ancient and modern. After the talk and questions he was given a hearty vote of thanks. With Her Majesty’s Jubilee to be celebrated in 1887, Boas was present at a meeting, held at the Town Hall, to discuss the ways this could be done. Later he made it known that he would deliver a sermon at the Synagogue and sing God Save the Queen in Hebrew. In August it was reported that among the numerous loyal addresses to her Majesty from South Australia one of the best and certainly the most original in design was that which bespoke the loyalty of the Hebrew colonists. At a meeting of the Jewish community of Adelaide in August 1887 it was decided to raise a fund to be presented to the Rev. AT Boas. It was pointed out that Boas had been associated as minister with the Jewish community without intermission for a period of nearly 18 years, and the meeting unanimously agreed that some recognition should be made of his services. After a short discussion it was resolved that a fund, to be called the Boas Presentation Fund, should be raised and presented to that gentleman. A committee was formed, and at the close of the meeting a substantial sum was at once subscribed. When it was presented to him in due course Boas said ‘this fact will still further encourage me to use my best efforts for the good of the congregation’. Early in 1890 Boas was appointed to the visiting committee of the Home for Incurables and three months later, together with H Sauerbier to its Management Committee. A year later he was still secretary of the Anglo Jewish Association and in April spoke about the importance of Federation of the Australian Colonies. That same year he made a mission tour to Broken Hill and Western Australia, travelling per RMS Shannon. The visit to the West took up more than a month with lectures in Perth and Fremantle. At every meeting he was welcomed and thanked for his efforts to help them forming a community. His lecture on 27 July 1891 at the Fremantle Town Hall was chaired by the Premier Sir John Forrest. He once again dealt with the topic of Popular Proverbs and National Sayings. This time he quoted some Irish examples such as; God heals; the doctor takes the fees, and he who cheats me once shame for him; he who cheats me twice shame for me. His last example, Every little helps to lighten the freight said the Dutch skipper as he threw his wife overboard, was much enjoyed. Needless to say that all of his lectures were attended by large numbers of people. Apart from his lectures there were many committee meetings to attend as well as visiting Jewish families. While in the West he started and consecrated a Sunday School and two cemeteries. The whole tour turned out very satisfactory and the Fremantle congregation presented him with a purse of sovereigns in recognition of his good work. It was hoped that Boas would be making further annual visits. He returned to Adelaide by the Britannia. No sooner was he back in Adelaide than he was asked to be the Elocutionary Judge at the Literary Societies’ Union. One of his last functions of 1891 was acting examiner at the Hebrew Sabbath School of which he was Headmaster. On this occasion his son Ide won a first prize for an essay on the life of Samuel. Boas became a foundation member of the District Training Nursing Society, established in 1894 which soon had branches in several suburbs. He was also Chairman of the board of the James Brown Memorial Trust for housing needy tuberculosis patients. It build a hospital at Belair and bought Estcourt House for £3000 and paid another £4000 to make it a home for crippled children and aged blinds. In 1895 he was a committee member of the South Adelaide Chreche. By the end of the year he had completed 25 years of service to the Jewish community! Nothing had changed though. Five days into the New Year and Boas was reappointed Committee member of the Adelaide Hebrew Philanthropic Society. On 16 January, the members of the Rainbow Concert Company, who had visited the many charitable institutions in the city and suburbs giving entertainments for the enjoyment of the inmates, making up a party of about 30, met at the residence of the Rev. Boas in Cover Street, North Adelaide, to bid farewell to Mr WT Maggs a member of the company, who was leaving for the Golden West. After that is was back to teaching, the usual round of meetings, with the Home for Incurables being the first, conducting weddings and funerals and visiting community members wherever possible. Towards the end of 1896 he again visited Western Australia for nearly six weeks. This time his pastoral visits extended as far as Albany, Fremantle, Perth and the goldfields of Kalgoorlie and Coolgardie, where he gave a lecture entitled; The Jew in Drama and Fiction. The local Adelaide Chronicle inserted the following report; On Tuesday 24 November the Rev. AT Boas returned by the RMS Ophir from a visit to Western Australia. He was absent for seven weeks and at Perth established a Jewish school, laid a foundation-stone, and gave a lecture. A trip was made to Coolgardie where he consecrated a Synagogue and Jewish cemetery and also lectured. Before leaving Perth he was presented with an address and a purse of sovereigns. He stated that the trip was, from an official point of view, successful though personally he suffered from ill-health. Boas was favourably impressed with the immense improvement of Perth since he was there five years ago, and he was astonished at the growth of the town of Coolgardie, where he spent an enjoyable time, and was hospitably entertained by the mayor Mr McDonald. Mr Boas intends at a future date to lecture on his impressions of the Western colony. At Passover in April 1898 Boas returned to his topic of Federation during his sermon at the Synagogue. He and his wife also celebrated their silver wedding and the Chronicle reported on 21 May that; notwithstanding the inclemency of the weather a large number of friends called to pay their respects. The popularity of the Rev. Gentleman and his lady was shown by the cosmopolitan nature of the callers, who included members of every denomination. Prominent among the visitors were the Right Hon. SJ Way and Mrs Way, the Hon. Dr Campbell, Mr VL Solomon, MP, and Mrs Solomon. Mr and Mrs Boas received a large number of congratulatory letters and telegrams and many handsome presents. In June his workload was further extended when he joined the committee of the newly opened University College Institute, a non-sectarian education facility in North Adelaide. Regardless of getting older, Boas’ workload remained the same for years to come. Slowing down was not one of the words in his dictionary. In January 1900 he reported that at the Estcourt House; the number of inmates consisted of 16 blind men, 9 blind women, 15 crippled boys and 6 girls, and of these one man and one woman had died. Three adults and 5 children have been admitted, 2 of the former and 2 of the latter have left, so there are now 45 inmates in the Home, while there are 4 applicants waiting admission. The general health of the inmates has been satisfactory. During that same year, above and beyond his many other commitments, he attended or chaired meetings, sometimes three, four or more times in a year of the District Training Nursing Association, Indian Famine Fund, Adelaide Jewish Literary Society, of which he was president, the South Adelaide Chreche, Home for the Incurables and many others, some of which required monthly meetings. No wonder one newspaper stated that ‘His ministry was one of energetic spiritual, social and intellectual leadership. In the days of his physical strength there was no more cheerfully useful citizen of Adelaide than the Rev. Boas’. 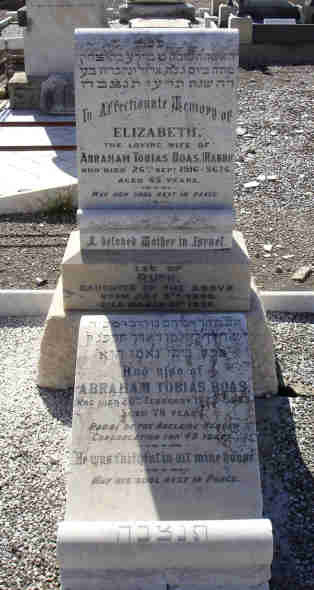 The influence of Abraham Tobias Boas was far greater and wider than his role as minister to the Jewish community of Adelaide might suggest. Apart from visits to Broken Hill and Western Australia he also addressed gatherings in Sydney, Melbourne, Hobart and Launceston. He actively created goodwill both within and outside the Jewish community by membership on boards of many inter-denominational philanthropic, social and cultural bodies. When Boas became the longest-serving Jewish minister in the British Empire in 1914 a reception to honour the occasion was held. The congregation presented their Rabbi with a Cutler Desk, and in his address in reply Boas said, ‘I have tried to be of some use to my fellow-men, Jew and Gentile, in the spheres of charity and benevolence, and in that of literature. My humble endeavours have been to render the name of Jew respected and I believe in this, my efforts resulted in some measure of success’. He finally resigned from official duties in 1918, two years after the death of his wife on 26 September 1916, in consequence of a stroke from which he never fully recovered. During the time of his ministry he had been associated with most philanthropic and public movements for almost 50 years. In 1921 he was given the official status of Rabbi in recognition of more than 50 years’ service to the Adelaide congregation. He died on 20 February 1923 at his home in Gover Street, North Adelaide and was buried in the Jewish section at West Terrace Cemetery. He was survived by nine of his children. His death was reported in all South Australian, Interstate and many country newspapers with some of them inserting lengthy obituaries. Some of the statements made in them referred to Boas as ‘A Valuable Citizen, few South Australians were as well known or respected as the late Rabbi, A venerable Rabbi, a true minister of religion, The late Hebrew Divine, A fine career of usefulness and eager to help any denomination’. Several of his children followed his example of long service. The eldest son, Lionel Tobias Boas, was for 36 years on the Subiaco Council in Western Australia, serving as mayor from 1917 to 1920. He also founded the Young Australia League in 1905 with JJ Simons of which he was President for over 40 years until his death in 1949. Laura Boas was well known in Sydney for having taught at the Great Synagogue Hebrew School for over 50 years, and for having been a member of the Synagogue’s Choir for over 30 years. She died in Sydney in September 1975, aged 86 years.